Things are moving along in my master bedroom! This week I was able to strip the second nightstand and paint one more wall. I was pleasantly surprised at how well the wood tones match on the two dressers. I love how they are similar but one is a little more masculine than the other! I bought a full set of brass pulls for this dresser, but I really like how the black knobs contrast the wood. So before I replace all of them, I’m going to try to match the missing one. I also need to add a little height to the dresser to match the one on the left. I tried the ones in the photo above but they aren’t working. I’m thinking I might try small wheels…we’ll see what I can find! What kind of lamps? The lamps in the photo are what I had originally and I’m thinking I need something a little darker. Do I keep the bench? 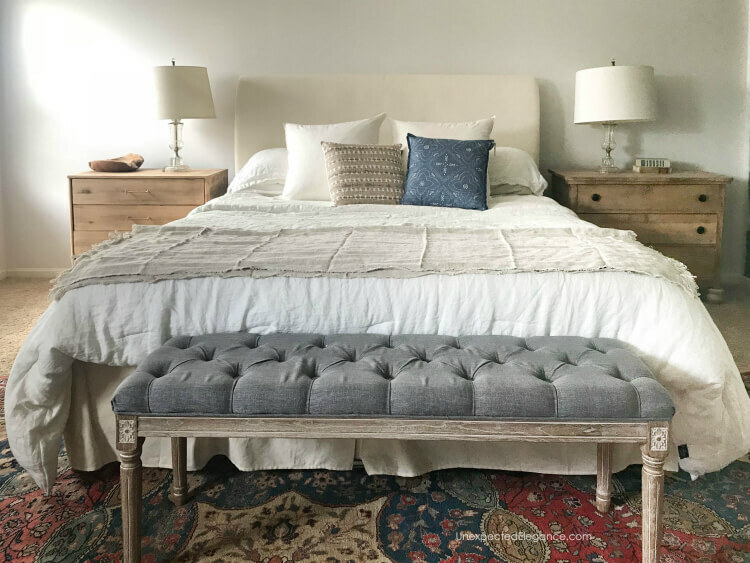 I like having the bench at the end of the bed, so I’m trying to decide on whether or not I’ll keep it or switch it out with another one I already own. Artwork…I think I’m going to leave the wall above the bed empty and add smaller artwork above the nightstands. What are your thoughts? That’s about all I have for now. Check back next for more progress! To see the design plan and what I’ve accomplished so far, check out Week 1 and Week 2. I love your bedroom, but if I were to hang any picture[s], I would hang a big beautiful picture you love, over the head of the bed since the headboard is not tall. I would not hang it over the nightstands, because the beautiful lamps already give the needed height. I would also get two to three books and place on the nightstands, then put a small terra-cotta pot and put some green fake flowers in them. 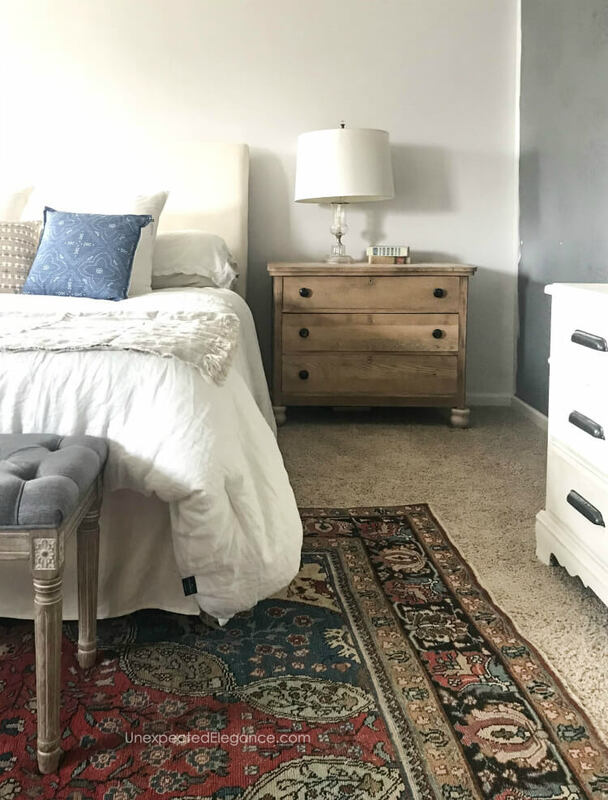 If I were to do anything with the nightstands, it would be to put a whitewash look, this would make them match beautifully with the gorgeous bench at the foot of the bed. yes, I would for sure leave the bench at the foot of the bed. I would add the arch-looking mirrors on top of the nightstands, placing them behind the lamps, leaning against the wall. 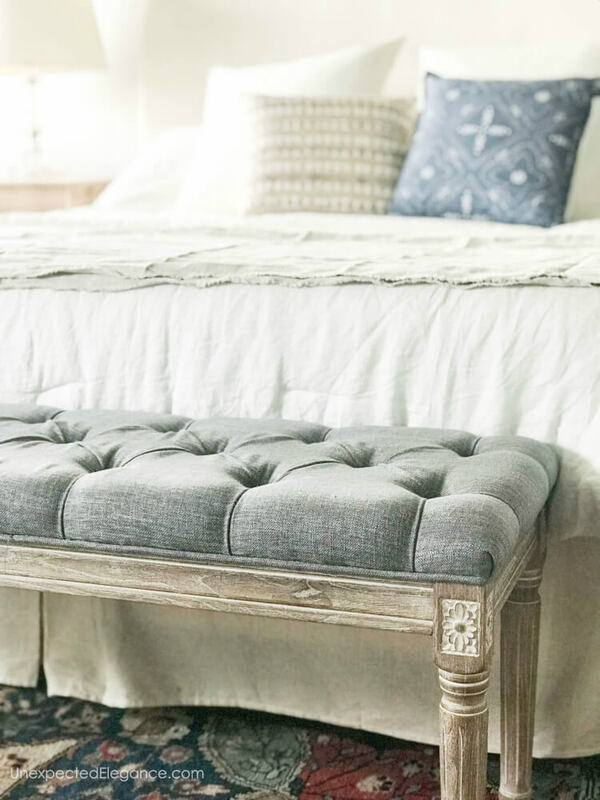 I have a question, where did you get the fabulous bench at the foot of your bed? if you made it, do you have a step by step tutorial on how you made it? I think a taller and skinnier lamp on each nightstand would look great. I like Ivory’s idea of putting a mirror on top of the nightstands and leaning them against the wall. And definitely keep the bench! I can’t wait to see the end result!